Warnham Nature Reserve is full of amazing animals and plants, from tiny pond creatures and wildflowers to Herons, Roe Deer and the tallest trees. 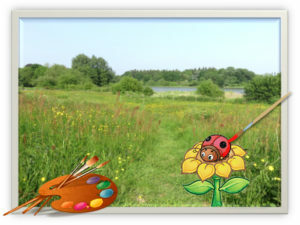 Enter our competition by drawing or painting a picture of an animal or plant you have seen at the Reserve. You can give your picture a background if you would like to. For full details pick up A FREE ENTRY form at the Visitor Centre or print one off from HERE. Entries will be accepted from 14th April to 30th June. This annual competition, jointly organised by The Friends of Warnham Local Nature Reserve and Horsham District Council, will be open for entries throughout the summer months (from 1st June to 31st August). Details of this year’s competition will be added as soon as they become available. Click HERE to see full results of the 2018 competition. As part of Horsham District Year of Culture, we are running a Warnham Wildlife Art competition for children (aged 3 to 16). To provide a Discovery Hub, Discovery Trail, and a new entrance garden. Funded by a grant from the European Agricultural Fund for Rural Development, HDC and the Friends of Warnham Local Nature Reserve. Winners of 2018 NPOTY competition. Heron’s Rest volunteers, and Hides and Paths volunteers needed.